Sludge remediation combats problems found in sludge at the bottom of ponds, lakes and rivers, particularly sulfides, mercaptans, ammonia, fatty acids, nitrates and other sources of odor and pollution. EUTRO-CLEAR is especially formulated to break down feed wastes and fish manures and waterfowl. It will break the cycle of sludge build-up, fish suffocation, algae crashes, over-growth of weeds and cattails. The time, complexity and cost of a clean-up is totally dependant on the condition of the water at the point when you begin treatments. Water quality analysis - water testing and assessment of, nutrient loading and determination of the biological diversity of the pond · Setting the criteria for the pond · Photograph pond for visual comparison · Calculation and determination of microbial products required and protocols to be followed · Preparation of project costing and time line. Visit 2 - Begin Biological Nutrient Removal (BNR) Application of BIO-BUFF Buffer : this will increase the alkalinity in the pond, allowing sufficient calcium for the microbes to multiply. Application of EUTRO-CLEAR bacteria. A synergistic blend of spore-forming Bacillus strains and gram-negative vegetative strains of bacteria. 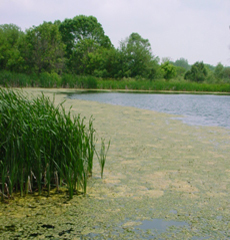 For areas of heavy contamination of algae blooms and cyanobacteria in lakes, ponds and storm water run-off. For heavy nutrient loading from non-point source contamination from agricultural areas or heavily fertilized lawns and for lakes that are affected by leachates from septic systems or industrial areas. Water testing to determine nutrient reduction rates. Applications of EUTRO-CLEAR . After stabilization of the pond, EUTRO-CLEAR will begin the bio-dredging process. Depending upon the initial condition of the water, this may take several applications over several weeks. Also, at this stage Ortho-phosphate is assimilated into cellular ATP by the competitive populations of microorganisms. Water testing to determine nutrient reduction rates. Application of NITRO-CLEAR Nitrifiers. This product provides the essential nitrifying bacteria specifically selected to bring about nitrification of ammonia nitrogen. Strains of Nitrobacter and Nitrosomonas, with superior talent for rapid nitrification under aerobic conditions, at a rate of 750 mg/L/Hr. Particularly where high build-up of excess nutrients leads to proliferation of excess algae, weeds and "cat tails". These nitrifiers consume 7.2 ppm of alkalinity for each ppm of ammonia oxidized to nitrate. Under anaerobic conditions in the soil at the bottom of the lake/pond the Nitrosomonas will carry out denitrification, helping to complete the nitrogen cycle. Provided that there is sufficient oxygen in the system, there is no danger of overdosing, even at 50 times normal dose. Water testing to determine nutrient reduction rates. Application of Eutro-Clear. Reduces turbidity and inhibits sludge build up, improves water clarity and algae. EUTRO-CLEAR thoroughly cleans the water of residual feed and feces, while participating in the natural carbon, nitrogen, phosphorus and sulphur cycles to enhance water quality. It uses a non-pathogenic consortium of gram-positive spore-forming Bacillus and non-spore forming microbes to aggressively consume a broad spectrum of pollutants, including surfactants, food fats and oils, sugars, starch, and nominal amounts of pesticides and hydrocarbons, while eliminating the formation of hydrogen sulphide and removing nitrate from the system as nitrogen gas. This step will also address cyanobacteria and associated toxins. Water testing to determine nutrient reduction rates. If additional phosphorous (SRP) reduction is necessary, it would be done after the final denitrification. The phosphorous is mineralized into an insoluble calcium phosphate, which precipitate out of solution, settle and form a sediment. pH levels are slightly elevated. This precipitate remains insoluble in pH conditions above 7.0. This is not a "Liming" or "Alum" treatment but rather a blend of organic and inorganic slow release oxygen compounds with a product to ortho-phosphate reduction rate of 3:1. As the phosphorous reduction may affect the pH, any adjustments to the pH would be done at this stage, using BIO-BUFF. Periodic re-seeding of the microbes will be necessary to maintain an ecologic balance and to preserve the natural trophic conditions within the pond. Long term maintenance schedules are determined by the ability to control point source and non-point source contamination and associated nutrient loading. Being able to control the source of the pollution can also assist in increasing the effectiveness of the remediation and reduce maintenance costs.